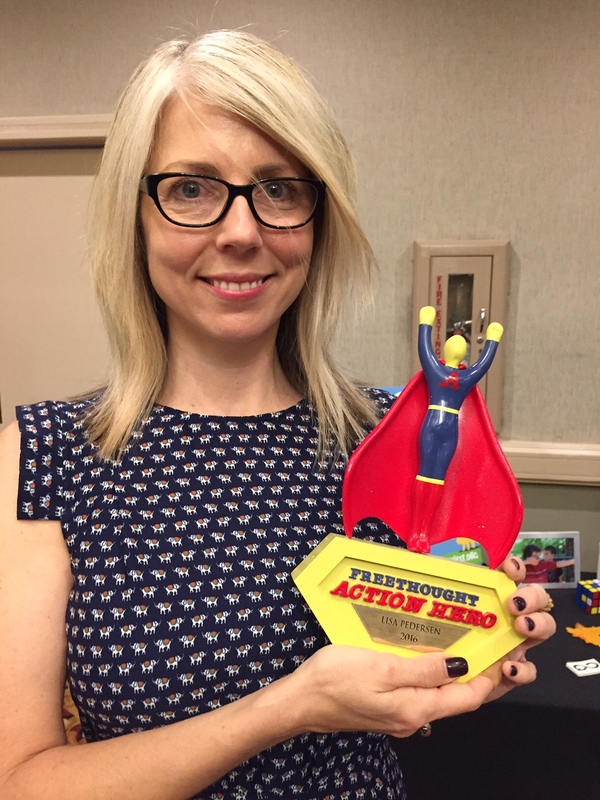 One thing that we had been talking about for years was a FreethoughtAction Hero Award. We wanted it to look and be different than other awards, and we think we might have accomplished this. Although it took awhile, we worked closely with the artist and sculptor to create this unique award. 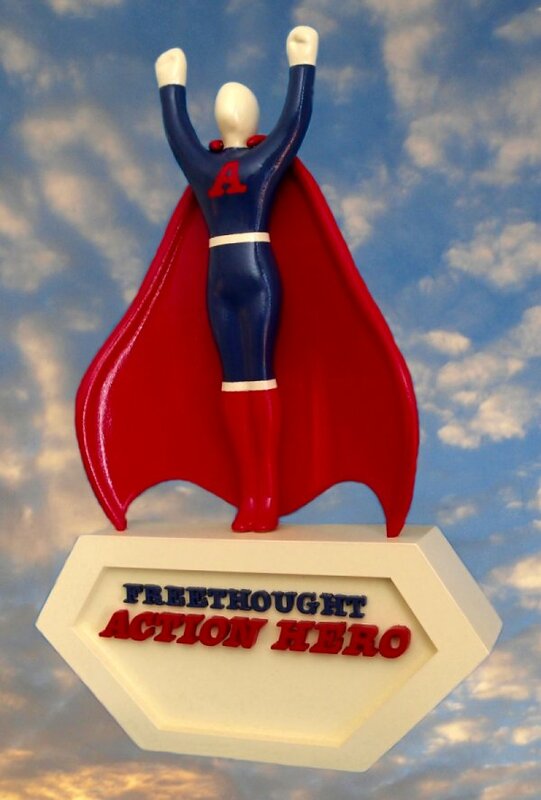 We have been presenting these awards to freethinkers who improve the image and acceptance of freethinkers through their good works, and to those who exhibit exceptional courage to stand up and be counted to help bring about a more secular and rational America. Lisa Pedersen is an ambassador, educator, advocate, and a humanist. She is a co-founder and former board member with the secular non-profit organization Friends of Freethought. She also founded the Women’s Secular Group of Southern California, which hosts an Adopt-A-Family outreach within secular communities. She raises awareness and educates the public on matters such as morality, the history of freethinkers, and activism. She does this in person and online, helping people access reference materials. She attends outreaches to educate the public as an example of what an atheist and humanist is. Lisa is also involved in many community service projects, raises money for orphanages, helps orphans and homeless children to receive free dental care, and in two years raised over $25,000 for Project Hope. 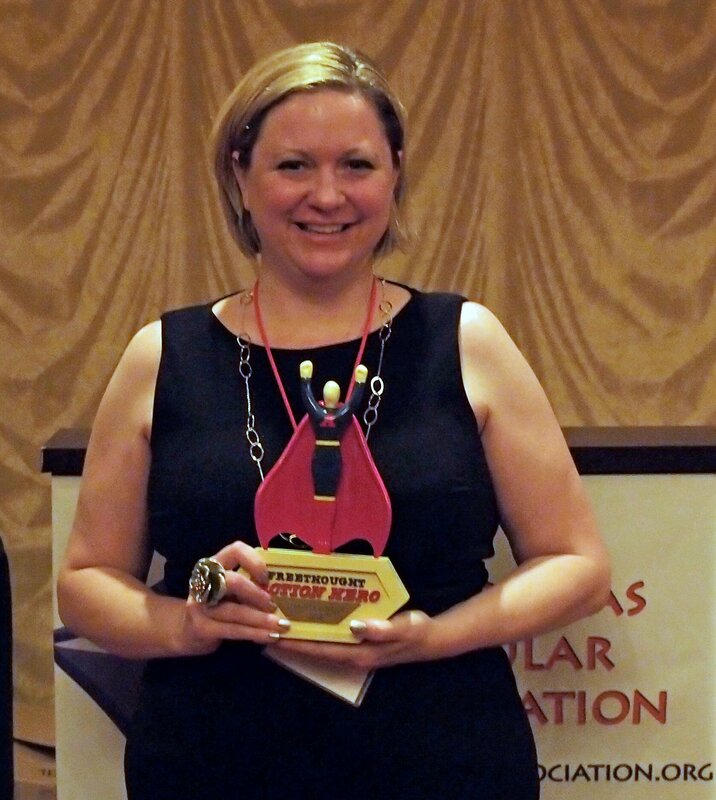 Lisa Pedersen became the fourth person to be presented with this award. Jennifer was one of six media representatives for the North Carolina statewide “One Nation Indivisible” billboard campaign we organized in 2010. The campaign received several rounds of media attention for over six weeks… local, national, and international. While there were plenty of positive responses, some involved received death threats and worse. Jennifer took the brunt of the adversity, but she was not intimidated. She withstood it with grace and courage, and she represented the campaign well. Jennifer became more involved in the movement after that. She organized several groups in her area, arranged book tours for humanist and freethought authors, helped organize a local coalition with UnitedCoR, helped organize a Secular Coalition for North Carolina and became co-president when it launched, became president of the newly formed Carolinas Secular Association, which grew out of the billboard campaign, and she has helped organize the annual Carolinas Secular Conference from 2013 to 2015. Harry has been involved with the freethought movement for years. He frequently has spoken at regional and national secular conferences about how to raise funds for local secular groups. 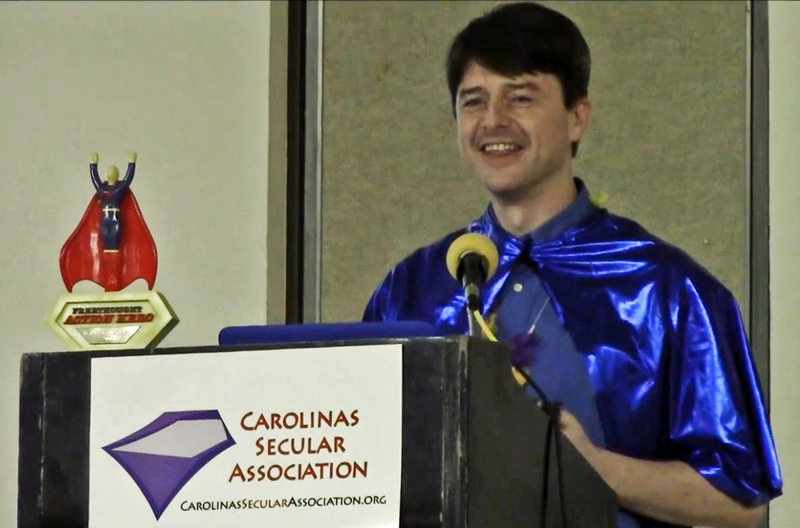 He has also been a guest speaker and very popular master of ceremonies for several Carolinas Secular Conferences, and, for the past several years, he has served as president for the Triangle Freethought Society–one of the two largest secular/freethought groups in NC–based in Raleigh. In March 2015, he and his family received a lot of attention from CNN, and his whole family were very publically ‘out’ as atheists. He and his family had to put up with a lot of adversity as a result of the attention. Harry Shaughnessy became the second person to be presented with this award. See: The Friendly Atheists Next Door and CNN Publishes a Lengthy, Positive Profile of an Atheist Family. Bobbie has served on the board of Camp Quest and of Atheists United, and on the advisory boards of the Humanist Association of Nepal. She is a past president of the Atheist Alliance International. She has written for The Rational Alternative, Secular Nation, Free Inquiry, American Atheist, La Raison and HUMAN magazines, as well as the Humanist Network News. She is a contributing author in three books: Parenting Beyond Belief: On Raising Ethical, Caring Kids without Religion; The Fundamentals of Extremism: the Christian Right in America; and Everything You Know about God Is Wrong (the Book). She has also made many television and radio appearances over the years. She has spoken to freethought groups throughout the United States, and has addressed atheists and humanists in Canada, Germany, France, India, Ireland, Nigeria and Cameroon. 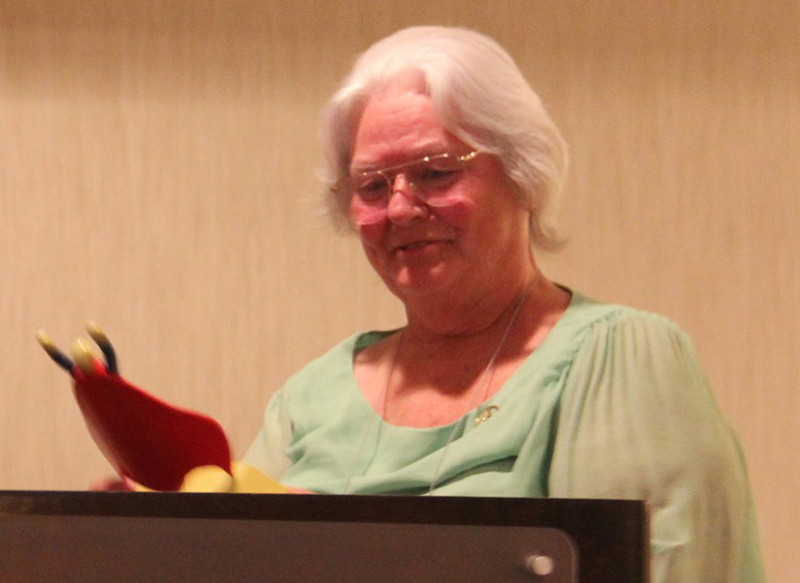 Bobbie Kirkhart became the third person to be presented with this award.